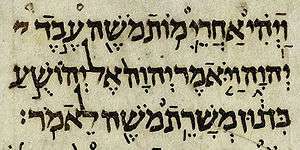 Ketuvim (/kətuːˈviːm, kəˈtuːvɪm/; Biblical Hebrew: כְּתוּבִים‎‎ Kəṯûḇîm, "writings") is the third and final section of the Tanakh (Hebrew Bible), after Torah (instruction) and Nevi'im (prophets). In English translations of the Hebrew Bible, this section is usually entitled "Writings". Another name used for this section is Hagiographa. The Ketuvim are believed to have been written under divine inspiration, but with one level less authority than that of prophecy. Found among the Writings within the Hebrew scriptures, I and II Chronicles form one book, along with Ezra and Nehemiah which form a single unit entitled "Ezra–Nehemiah". (In citations by chapter and verse numbers, however, the Hebrew equivalents of "Nehemiah", "I Chronicles" and "II Chronicles" are used, as the system of chapter division was imported from Christian usage.) Collectively, eleven books are included in the Ketuvim. These three books are also the only ones in the Hebrew Bible with a special system of cantillation notes that are designed to emphasize parallel stichs within verses. However, the beginning and end of the book of Job are in the normal prose system. The five relatively short books of Song of Songs, Book of Ruth, the Book of Lamentations, Ecclesiastes and Book of Esther are collectively known as the Hamesh Megillot (Five Megillot). These are the latest books collected and designated as "authoritative" in the Jewish canon. These scrolls are traditionally read over the course of the year in many Jewish communities. The list below presents them in the order they are read in the synagogue on holidays, beginning with the Song of Solomon on Passover. These two also describe relatively late events (i.e. the Babylonian captivity and the subsequent restoration of Zion). The Ketuvim is the last of the three portions of the Tanakh to have been accepted as Biblical canon, it is said that the people of Israel were adding what would become the Ketuvim to their holy literature shortly after the canonization of the prophets. There is no scholarly consensus as to when the Hebrew Bible canon was fixed: some scholars argue that it was fixed by the Hasmonean dynasty, while others argue it was not fixed until the second century CE or even later. While the Torah may have been considered canon by Israel as early as the 5th century BCE and the Former and Latter Prophets were canonized by the 2nd century BCE, Michael Coogan says that the Ketuvim was not a fixed canon until the 2nd century CE. According to T. Henshaw, as early as 132 BCE some references suggesting that the Ketuvim was starting to take shape, though it lacked a formal title. Jacob Neusner says something different, he argues that the notion of a biblical canon was not prominent in 2nd-century Rabbinic Judaism or even later. Against Apion, the writing of Josephus in 95 CE, treated the text of the Hebrew Bible as a closed canon to which "... no one has ventured either to add, or to remove, or to alter a syllable..."; Michael Barber, however, avers that Josephus' canon is "not identical to that of the modern Hebrew Bible". For a long time, following this date, the divine inspiration of Esther, the Song of Songs, and Ecclesiastes was often under scrutiny. In the 20th century, many scholars seemed to believe that the limits of the Ketuvim as canonized scripture were determined by the Council of Jamnia (c. 90 CE). But the theory of the Council of Jamnia is largely discredited today. 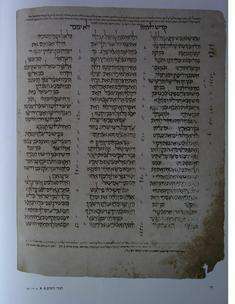 The Aleppo Codex from a facsimile edition. This file contains Ketuvim from the manuscript, including Chronicles, Psalms, Job, Proverbs, Ruth, and the beginning of the Song of Songs. The manuscript is missing the end of Ketuvim, including the rest of the Song of Songs, Ecclesiastes, Lamentations and Esther. There is no formal system of synagogal reading of Ketuvim equivalent to the Torah portion and haftarah. It is thought that there was once a cycle for reading the Psalms, parallel to the triennial cycle for Torah reading, as the number of psalms (150) is similar to the number of Torah portions in that cycle, and remnants of this tradition exist in Italy. All Jewish liturgies contain copious extracts from the Psalms, but these are normally sung to a regular recitative or rhythmic tune rather than read or chanted. Some communities also have a custom of reading Proverbs in the weeks following Pesach, and Job on the Ninth of Ab. The five megillot are read on the festivals, as mentioned above, though Sephardim have no custom of public reading of Song of Songs on Passover or Ecclesiastes on Sukkot. There are traces of an early custom of reading a haftarah from Ketuvim on Shabbat afternoons, but this does not survive in any community. Some Reform communities that operate a triennial cycle choose haftarot on Shabbat morning from Ketuvim as well as Neviim. In some Near and Middle Eastern Jewish traditions, the whole of Ketuvim (as well as the rest of the Tanakh and the Mishnah) is read each year on a weekly rota, usually on Shabbat afternoons. These reading sessions are not considered to be synagogue services, and often took place in the synagogue courtyard. Medieval sources speak of three cantillation melodies, for Torah, Nevi'im and Ketuvim respectively. Today the position is more complicated. Oriental Sephardic communities preserve cantillation systems for the three poetic books, namely Psalms, Proverbs and the main part of Job (usually a different melody for each of the three books). No such systems exist in the Ashkenazi or Spanish and Portuguese traditions. However, the Ashkenazic yeshiva known as Aderet Eliyahu, in the Old City of Jerusalem, uses an adaptation of the Syrian cantillation-melody for these books, and this is becoming more popular among other Ashkenazim as well. In all communities there are special cantillation melodies for Lamentations and Esther, and in some communities for the Song of Songs. Otherwise, the melody for the book of Ruth is considered the "default" melody for books of the Ketuvim not otherwise provided for. The "prose" passages at the beginning and end of the book of Job, as read on Tisha B'Av, may be read either to the tune of Ruth or to one resembling that for the Song of Songs. Western targumim exist on Sifrei Emet, on the Five Megillot and on Chronicles, i.e. on all the books of Ketuvim besides Daniel and Ezra (which contain large portions in Aramaic anyway). There are several complementary targumim to Esther. There is, however, no "official" eastern (Babylonian) targum to Ketuvim, equivalent to Targum Onkelos on the Torah and Targum Jonathan on Nevi'im. In fact, the Babylonian Talmud explicitly notes the lack of a Targum to Ketuvim, explaining that Jonathan ben Uzziel was divinely prevented from completing his translation of the Bible. A more prosaic explanation may consist in the lack of regular formal readings of Ketuvim in the synagogue (except the five Megillot), making it unnecessary to have an official system for line-by-line translation. ↑ "Ketuvim". Random House Webster's Unabridged Dictionary. ↑ The first wave of synergism produced extraordinary results in terms of contemporary standards of literacy and belles lettres. The communal response of the first generation of Jews after the Exile had set the tone for centuries to come. Out of exile and diaspora had come at least two segments of the Hebrew Bible as we know it, Torah and Prophets, which were redacted no later than the end of the Persian period (circa 400 BCE); the third section of the Bible (the "Hagiographa") was available by this time as well. What was to become normative after 70 C.E. in Judaism had mostly been achieved and promulgated a half millennium before. — The Challenge of Hellenism for Early Judaism and Christianity by Eric M. Meyers, The Biblical Archaeologist, Vol. 55, No. 2 (Jun., 1992), pp. 84–91. Published by: The American Schools of Oriental Research. ↑ Philip R. Davies in The Canon Debate, page 50: "With many other scholars, I conclude that the fixing of a canonical list was almost certainly the achievement of the Hasmonean dynasty." 1 2 McDonald & Sanders, The Canon Debate, 2002, page 5, cited are Neusner's Judaism and Christianity in the Age of Constantine, pages 128–145, and Midrash in Context: Exegesis in Formative Judaism, pages 1–22. ↑ Barber, Michael (2006-03-04). "Loose Canons: The Development of the Old Testament (Part 1)". ↑ Anchor Bible Dictionary Vol. III, pp. 634–7 (New York 1992). ↑ McDonald & Sanders, editors, The Canon Debate, 2002, chapter 9: Jamnia Revisited by Jack P. Lewis. David Betesh and the Sephardic Pizmonim Project (Syrian melodies). Tehillim (Psalms) on CD-Rom (Syrian tradition, Rabbi Shimon Alouf). Leining Master, Ashkenazi melodies for the five megillot. "Potpourri for Purim", melodies for Megillat Ester in various traditional styles.